" I don't like to snowshoe," said Dollie " they make me feel like I'm waddling". Sigh, an opening for so many jokes best left untold in interest of marital harmony. So in concession to a reluctant wife, the groomed and flat (read "easy") Pizza Connection Trail would be the snow hike of choice. 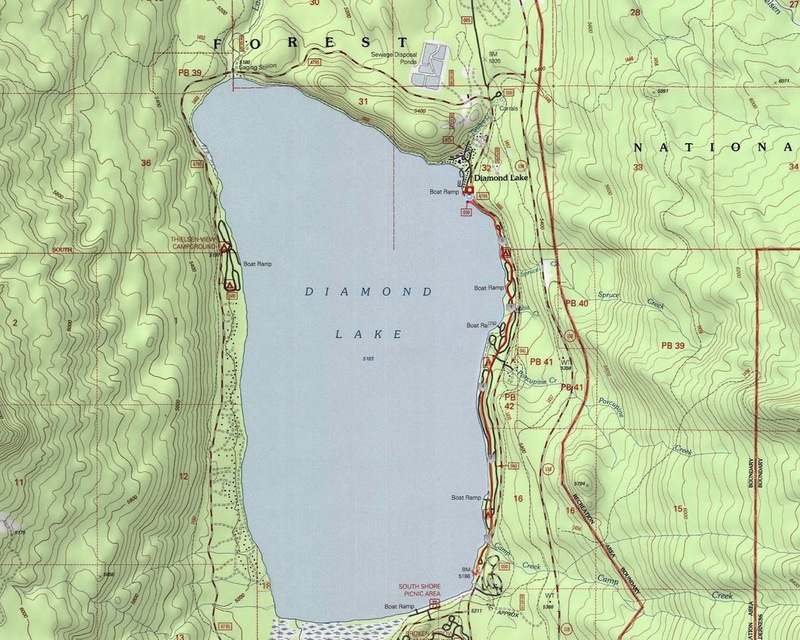 In winter, Diamond Lake freezes over and becomes primarily a playground for the snowmobile crowd. Throwing skiers a snowy bone, the groomed road through the summer campground is designated as a cross country ski route. 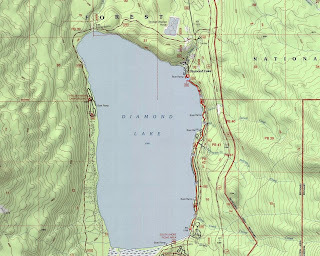 Running from the Diamond Lake Lodge to the pizza parlor on the southeast corner of the lake, the manicured road has been dubbed the Pizza Connection Trail. The restaurant is accessible only by snowmobile (on their own road, apart from the ski trail), by ski, or by snowshoe (the poor step-relative to cross country skiing). Pizza and a heated restaurant interior is the reward for intrepid skiers and 'shoers. Beginning at the boat ramp parking lot, we set off alongside the east shore of frozen Diamond Lake. Gone were the sparkling blue waters of the lake, replaced instead by an expanse of white ice. Like ants on a wedding cake, ice fishermen dotted the snow-covered ice. A low cloud cover hung over the lake and Mount Bailey played coy with snowshoeing photographers, the mountain never quite making a complete appearance over the frozen lake. As we walked, the cloud cover became thinner and thinner just like underwear over time, and before long, we had blue skies, white snow, and a sunny day. However, the sunlight was as weak as a bowl of watery gruel and temperatures remained well below freezing. The campgrounds were covered with snow and the only indication we were even walking through a campground were the tips of drinking fountains poking up out of the snow or an occasional mound of snow that was barely recognizable as a picnic table. Snowshoe hare tracks crisscrossed the trail but we never saw any as the noisy crunch of our snowshoes warned them well in advance of our arrival. After nearly 3 miles of steady walking on the groomed trail, we arrived at the pizza restaurant and the sweet odor of pizza was entrancing. However, Dollie was not hungry so I had to make do with sniffing the aroma over a rumbling stomach. Trail mix is a poor substitute for pizza. We walked out onto Diamond Lake for a better view of the large frozen expanse of the lake. Mount Bailey was nearly visible in its entirety and we could see the craggy peaks on Crater Lake's rim. On the way back, an arctic breeze kicked in and dark clouds covered up the scenery, sucking the warmth and light out of the air like a surprise visit from a parole officer. We picked up our pace, eager to beat the impending storm. I'm glad to report that no wives were frozen in the hiking of this hike and a good time was had by all. For more pictures of this trail, please visit the Flickr album.